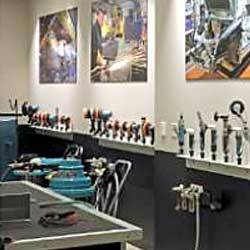 Dynabrade has successfully taken on the role of leading the industry in training for distributors and end users. We offer a variety of options for customers to familiarize themselves with Dynabrade as a company, the premium abrasive power tools we offer, and how we are a systems and solutions company; looking far beyond the tool and focusing in on improving work conditions for the operator. 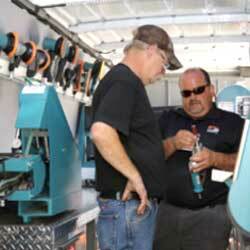 Whether customers want to take a visit to our facility or get trained on the road, we are sure to have an option! Dynabrade has a couple of newly remodeled training facilities within their worldwide headquarters – just outside of Buffalo, New York. 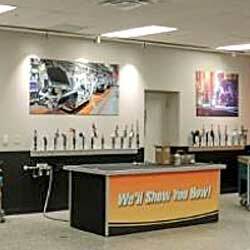 Our Knowledge Center, is a formal conference room/theater surrounded by large pictures of the industries we sell to. This room can comfortably fit over one hundred people. 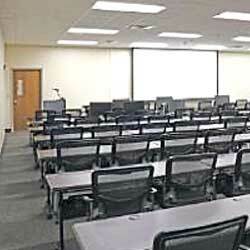 With all the latest in electronic presentation technology, this room is perfect for hosting any classroom style training. In addition, we also have the newly remodeled Walter Welsch Training Facility. Named after our founder, this room contains a wide array of the 850 plus Dynabrade tools and source capture options we offer. The room is thoroughly equipped with a world-class air system and is set up to allow customers to have the ultimate hands-on experience and see how our product can meet a tremendous amount of real-world applications. 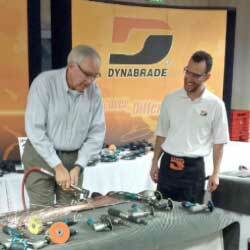 The Dynabrade Corporate Training Team hosts six to eight tool clinics each year in a variety of locations. These tool clinics feature a hands-on approach where customers will be educated on Dynabrade tools and see all that we have to offer. Each tool clinic consists of six to eight sessions, so it is individualized for each group to ensure it is as valuable as possible. 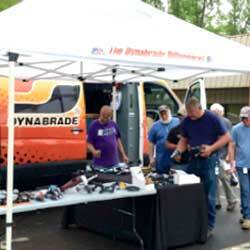 Please contact your local Dynabrade Territory Manager for the next time we are in your area. 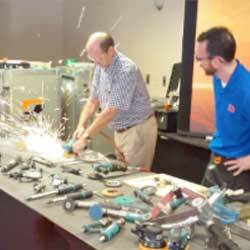 Have a thorough understanding of all the power tools Dynabrade offers and the industries we reach out to. Have experience running the main tools and understand the applications they meet. 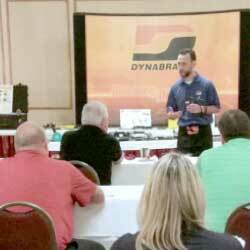 Be familiar with new products Dynabrade has just released and have experience running these tools. Understand what Dynabrade offers for source capture options and what option best suites customers. Have an understanding of how Dynabrade provides solutions for air systems and air system maintenance. 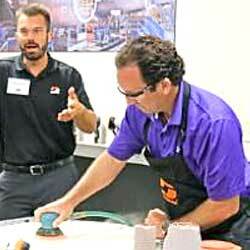 Furthermore, clinic attendees will see how this can affect power tool performance and abrasive utilization. Have a comprehension of Dynabrade's Cost-Savings Program and the tremendous value we, as a team, can bring to end users. Dynabrade now boasts three DynaVans throughout the United States – one in each of our three regions – East, Central, and West. These are full-size Sprinter Vans that feature an elaborate, eye-catching external Dynabrade design. Inside these DynaVans you will see a variety of power tools, as well as some of our Raptor Vacuums and a Downdraft Table. 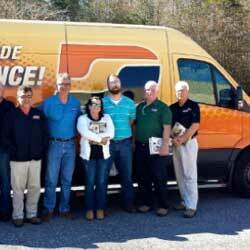 The DynaVans are a great source for hosting lunch-and-learns at distributor branches or going right to an end user with it. After thoroughly experiencing the DynaVan, one is sure to fully comprehend the "Dynabrade Difference."